Jeaneane Fowler was formerly Head of Philosophy and Religious Studies at the University of Wales, Newport, and later an Honorary Research Fellow. Her publications include Hinduism: Beliefs and Practices (Choice Outstanding Title, 1997). Merv Fowler was also formerly Head of Philosophy and Religious Studies at the University of Wales. His publications include Buddhism: Beliefs and practices and Zen Buddhism. The authors have collaborated before for World Religions: An introduction for students. 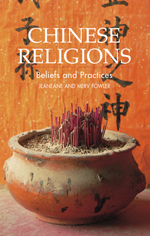 This book brings together the studies of Jeaneane Fowler in Taoism, Chinese popular religion and the broader canvas of Chinese cosmogony, and those of Merv Fowler in Confucianism, Ch’an (Zen) Buddhism and Pure Land Buddhism. Chinese Religions requires no previous knowledge and thereby serves as an introduction to the religions of China, and places it in the wider context of Chinese history and philosophy. The facets of Chinese religions are as broad, multilayered and varied as the geographical vastness of China itself, yet so many Chinese beliefs have found their way into the West – the theory of yin and yang, the I Ching, the Tao Te Ching are good examples. Yun-men/Yunmen (Jap. Ummon) and the "pass of a single word"
This volume is an accessible yet thorough guide to the rich world of Chinese religions. Separate chapters describe the history, belief, myths, texts, central thinkers, and practice of Taoism (both classical and religious), Confucianism, Neo-Confucianism, Buddhism (both Zen and Pure Land), and popular religion, with separate discussion of the various religions in contemporary China.